I used to be one of those people that grilled with the lid open, flipping and turning constantly over an open flame hoping for the best. What I usually ended up with was some type of meat that was undercooked inside and burnt on the outside. More times than I wish to remember it resulted in tossing the meat and ordering take out. Until I started doing some research. Ahhhh…the internet really is a beautiful thing. 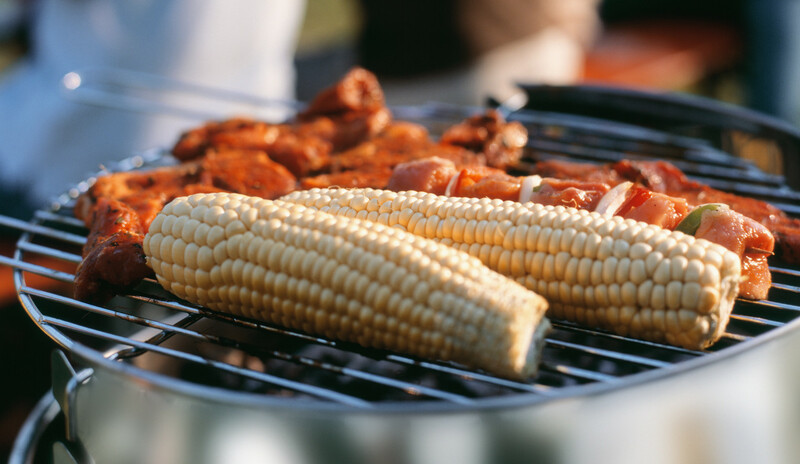 Cooking on the grill really is super simple. I mean, really, really super simple. Preheat grill, brush hot grates, put meat on, flip meat, take meat off, eat. You really can’t get easier then that. No dirty pots and pans to clean??? Count me in!!! Second, Do not cut into the meat. If you do, you’ll let all the juices out. Third, Use a timer. Put the meat on the grill, close the lid, set the timer and walk away. Otherwise you’ll be tempted to break the first rule. Fourth, let it rest. Give your meat at least five full minutes of rest (longer rest time for larger cuts of meat), after cooking. Make a little tin foil tent over the food and swat all the fingers away that are attempting to have “just a little piece”. Fifth, When cooking steaks, allow it to come to room temperature BEFORE grilling. I usually take the steak out of the fridge when I start to prep my meal and before preheating the grill. This is a list that you can print out. 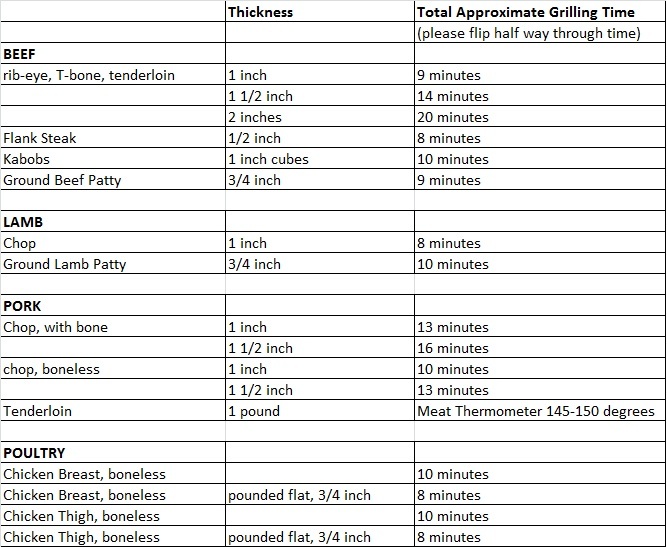 It has approximate grilling times for popular grilling items. The times listed below our for our preferences. We like our food cooked medium-rare for items like lamb and medium for beef. 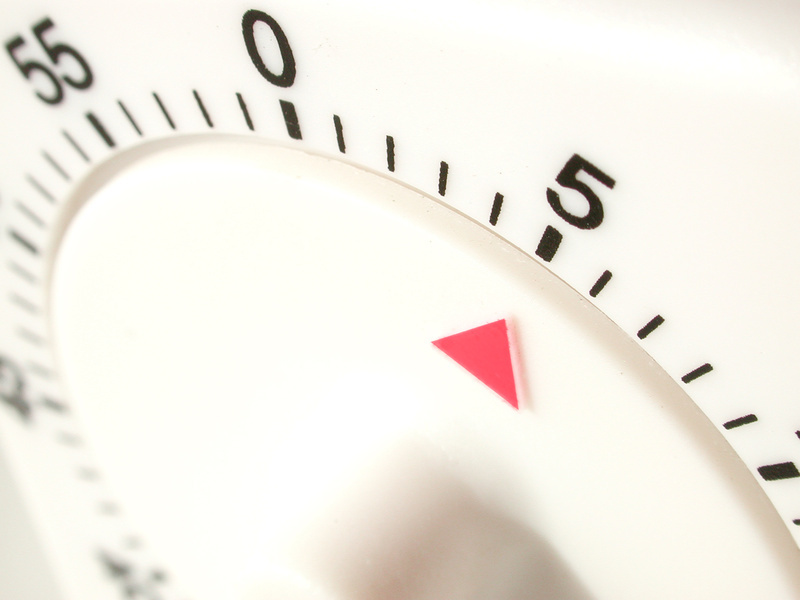 If you like your food cooked longer, then add a minute or two to the times below. As always, consuming raw or undercooked meats, poultry, shellfish or eggs may increase your risk of foodborne illness, especially if you have certain medical conditions. PS If you know someone that could use this helpful information then by all means…please share it. I'm liking the format. All good advice, I'll add that if cooking a steak then it's not a bad idea to get it as close to room temp as possible before cooking.